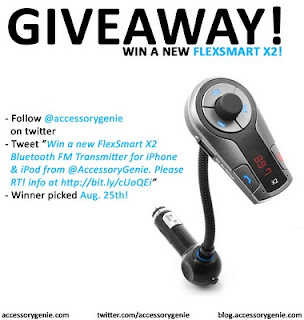 Yesterday marked the end of the Twitter Giveaway for the new FlexSmart X2 Bluetooth FM Transmitter. The lucky winner of the giveaway is @saraminda. Congratulations on winning the new FlexSmart X2!!! The contest was a success and we'll be hosting similar giveaways in the future. We'd really like to know what you think the next big giveaway should be?? Please go to: http://www.accessorygenie.com and let us know what gadget or electronic device you'd like to see given away in the next contest. Win a New FlexSmart X2 Bluetooth FM Transmitter! !